Chicha @Soho (Hong Kong, China) | Get Your Grub On! Since in Hong Kong we wanted to go back to ‘Brickhouse‘ in LKF but since they still had a 1.5 hour waiting list at 9:30 p.m. we continued further hunting on the hills. We wanted to have some sort of tacos though and apparently fate was in our favour tonight as some people didn’t show up for the booking at ‘Chicha’ a Peruvian restaurant on Peel Street and without further ado we snatched it away. 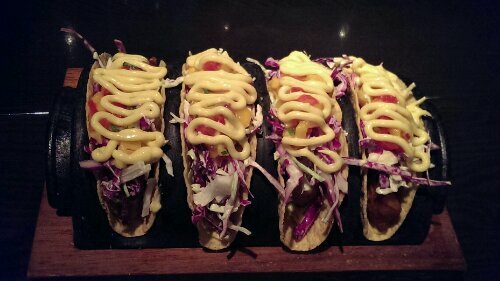 I never would’ve thought that I like hardshell tacos but these ‘Fish Tacos‘ were brilliant, a bit difficult to eat but super flavourful with the fried moist fish, the crunchy coleslaw and the fruity and sweet mango salsa, delicious. We had the fried ‘Chicken Tacos‘ as well but those unfortunately were a bit dry and not as much fun. 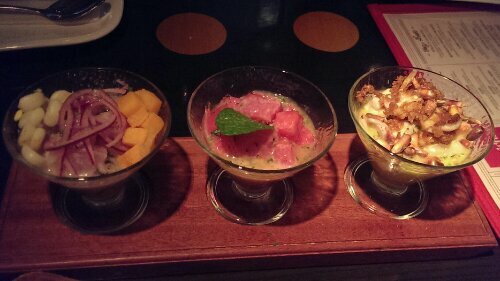 We couldn’t decide which ‘Ceviche‘ to take so we ordered the tasting set with three smaller sized portions of all. My favourite was the one with seabass (‘Corvina‘) on the left, the fish was fantastic fresh and had a pleasantly firm texture. 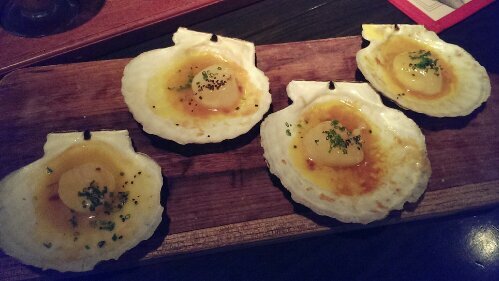 My second choice was the ‘Mixto‘ which had everything in it – shrimp, octopus, scallop, squid – mixed with some fruity passionfruit and honey, a nice mix of textures as well. The ‘Tuna‘ version was also good but a bit of a weird combination with the watermelon and the fish actually was a bit tough to chew. They also have some dishes which they call ‘Hot Ceviche‘ which of we had the scallops. This could’ve been outstanding with the extremely awesome humongous scallops and the mix of butter, lime, soy and honey if only the cook would have taken it easier on the salt (a german saying suggests he was in love). Still good but mouth-drying salty which unfortunately overpowered the other flavours too much. 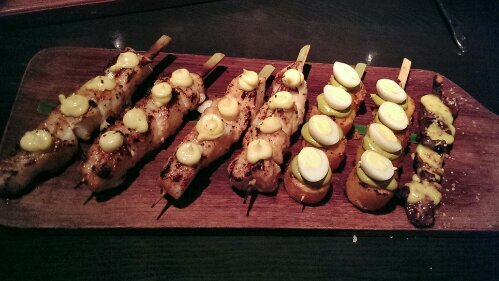 Next up we ordered a selection of the ‘Anticuchos‘ (grilled skewers), the ‘Oh My Cod‘ would have been the shining star if they weren’t prepared by the same Romeo cook as the scallops; super tasty moist fish, miso glazed that took an extensive salt bath. Well the sweet potato with the quail egg was okay but still only sweet potato, however the beef hearts again were amazing, perfectly seasoned, not too gamey, just pure muscle with a strong beef taste. 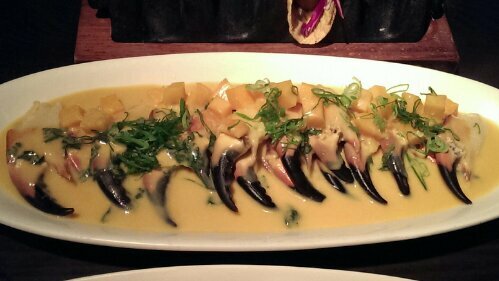 Another ‘Hot Ceviche‘ we tried was ‘Crab Claw‘ which was, as the name suggested, a huge plate of pre-cracked crab claws in an extremely sour sauce. The crabs were nicely fresh and no hazzle easily sucked off the shells but the sauce was just too acidy for me to enjoy it fully. 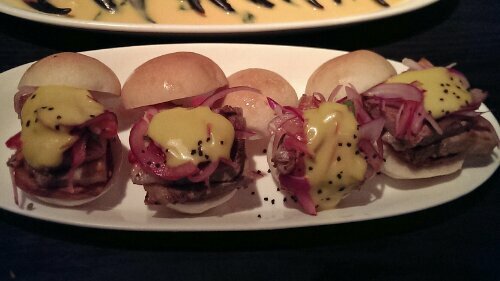 We were already pretty full but had one more thing coming up, their suckling pig sliders which were super good, suckling meat indeed sitting on a thin slice of sweet potato and topped with some pickled onions and gooey cheese. Great buns too and the whole thing reminded me a bit of the pork buns you get in the old town of Duesseldorf even that this here was a way more delicate and less greasy version. I totally loved ‘Chicha’, the staff was great and obviously had some romantics amongst them, the food, besides the extreme overdosing with salt of some dishes was delicious and really something special and all in all we had a lovely evening with a nice atmosphere. Oh, they also do some quite decent cocktails here as well.